Pioneer Yurt is now available to rent in the summer! Tucked at the edge of a sub-alpine meadow at 8700 feet, the Pioneer Yurt is the ultimate alpine getaway. Enjoy stunning views of the spectacular Pioneer Mountains, and relax with nearly all the comforts of home, and none of the distractions. The Pioneer Yurt is perfectly situated for adventures into the alpine including ascents of the nearby Hyndman Peak (12009'), the tallest peak in the Sun Valley area, as well as many other beautiful summits. Below the craggy peaks lie beautiful alpine basins filled with wild flowers, small ponds, waterfalls and unparalleled opportunities for exploration and seclusion. Access to the Pioneer Yurt in the summer follows a gradual trail up the Hyndman Creek canyon for 2.5 miles before climbing steeply for 1000' over 1 mile (3.5 miles/1800' in total). It is possible (and fun) to ride a mountain bike for the 1st 2.5 miles, before switching to hiking shoes for the final mile. 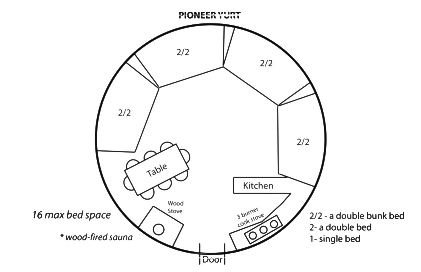 The Pioneer Yurt is a cozy 24' Yurt with sleeping space for up to 16 people. All amenities are supplied at the yurt, including a full kitchen with a 3-burner propane stove, bunk beds with comfy sleeping pads, outhouse, wood fired Sauna, Goal Zero solar powered lanterns for light and speaker for mp3 players, an outdoor fire-pit, and pre-cut firewood. Cell phones do not work at the yurt. You only need to bring your sleeping bags, food, and beverages. Weekend (Friday, Saturday) minimum rate of $400/night applies for up to eight guests, $50 for each additional person. Weeknights (Sunday through Thursday) minimum rate of $200/night for up to four guests, $50 for each additional person. Additional kids from six to twelve are $25/night. Reservations for fewer than eight may share the hut with additional guests. If you would like to guarantee a private hut, please reserve for eight. It is required that at least one member of your group be familiar with the route, access and correct hut operations. Sun Valley Mountain Huts provides porter ($200) and Hut Rent Guide services to make your life easier. Please visit the Services page for additional details. Would you like a guide for the duration of your trip? Learn about our partner guide outfitter here. We’d like you to have a phenomenal experience while staying at our huts! Good preparation before your trip will make the difference between an amazing adventure or an ‘epic’ one. If you choosing not to hire a professional guide you are entirely responsible for yourself and group. Here are some helpful resources to assist in the planning process: Weather Forecast: Pioneer Yurt. Please be sure that everyone in your group reviews the information and links found on this page. Each participant is required to fill out the online release form prior to departure. Let us know if you have any questions. You can find useful additional resources on our Links Page.